In 2007, IAF started a procurement programme for the purchase of 126 medium multi-role combat aircraft (MMRCA) which fell through in 2013 and India later purchased 36 Rafale jets from France for Euro 7.8 billion. This left the IAF’s shortage of fighter jets unanswered. In the meantime, reportedly, India’s plan of jointly developing 5th generation fighter jets, based on Su-57 (earlier T-50), with Russia was dropped as the two sides could not arrive at an agreement. At a time, when all the major air forces are in process of acquiring 5th generation fighters, India has lost an opportunity to acquire the much required 5th generation technology and aircraft which could have become the bedrock for the indigenous Advanced Medium Combat Aircraft (AMCA). In the early part of this decade, India appeared to have a well thought out plan to re-equip its air force with a mix of 272 Russian heavy fighter Su-30 MKI, 126 MMRCA, around 200 indigenous Light Combat Aircraft (LCA), co-developing 5th gen with Russia and homegrown AMCA. In a phased manner, the plan would have not only increased the total number of fighters in IAF’s fleet but, for the first time, would have also given it the luxury of knowing its fleet of future. But, this did not happen and IAF is struggling to maintain its relevance. All this could have changed had India focused on getting the 5th generation programme with Russia started. 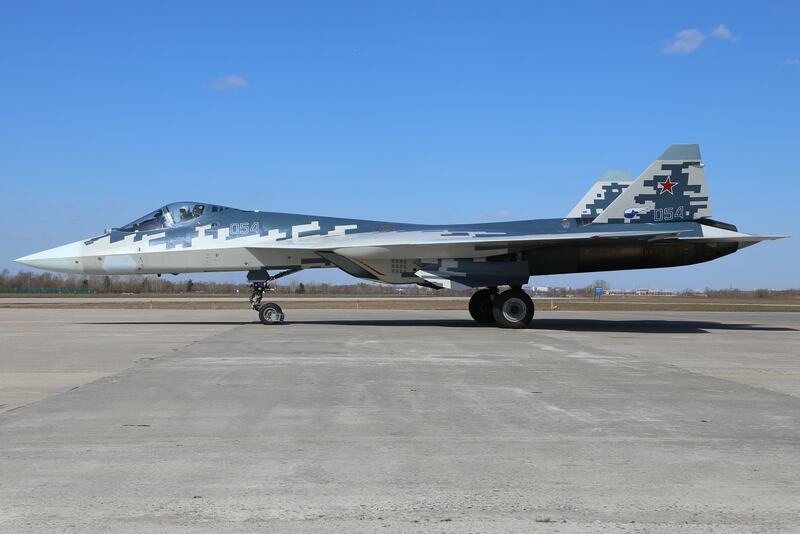 The aircraft made its operational debut earlier this year when it took part in Syrian war which led to a lot of talks on its capabilities in the press. For the first time in history, two 5th generation fighters from adversary air forces were carrying out the mission in a contested airspace. This gave the best opportunity for the two sides to evaluate the capability of adversary aircraft and also of their own aircraft. The assessment of the two sides would be known to only them and the rest can only make intelligent guesses. The assessment will definitely reflect in the next upgrade of the aircraft. Su-57 is a single seater twin engine, air-superiority, stealth fighter, capable of carrying 9 tons of weapons to a maximum range of 3500 km. It can reach a top speed of Mach 2. The aircraft can fly as high as 20,000 m. It has six internal and six external hardpoints to carry a variety of missiles and bombs for all possible requirements of war. The avionics suite in this aircraft is designed to let pilot focus on the mission at hand rather than flying. The aircraft gets situation awareness through three NIIP N036-1-01 X-band AESA radar, one mounted on nose and two on either cheek of the aircraft just below the pilot seats. This gives a much larger radar coverage area, reduces the blind spots of main radar, and reportedly is capable of locating even stealth aircraft. In addition, the aircraft comes with L-band AESA radar for target identification and also has another X band AESA at its tail end for better missile guidance. In addition, to the radar Su-57 is armed with UOMZ 101KS Atoll electro-optical system includes the 101KS-V infra-red search and track (IRST) which can identify aircraft and missiles through their heat signature much beyond the onboard radar’s range. This is one technology where Russian are undoubtedly the best. Off late, western fighters have begun integrating IRST in their aircraft. One of the most important features of IRST is that it allows aircraft to track the airspace without emitting any radiation. The IRST is a passive technology and allows aircraft to track and acquire targets without getting within the range of enemy radar or starting onboard radar. Every stealth aircraft gives out some heat signature and that can be used to locate them through IRST. So, in a way, it is a stealth killer. The aircraft is also mounted with an electro-optic countermeasure to confuse the incoming infrared guided heat seeking missile system and push them away from the aircraft. In addition, it also has an ultra-violet warning system. All of these radars and sensors are part of the new avionics suite integrated with an information control system (ICS), which employs stand-by multiple processor computers and high-speed information exchange channels ensuring complex processing of information obtained from surveillance and targeting systems and providing situational awareness to the pilot in challenging combat situations. Su-57 is powered by AL 41 engine, the original engine or stage-1 engine. However, post-2020, the aircraft is expected to fly with more powerful stage-2 izdeliye 30 which would not require any substantial structural change to the aircraft. The Intergovernmental Agreement for Joint Development of the 5th generation fighter was signed in 2007. The contract for drawing and engineering design was signed in 2010. In 2016 the contract was initiated but things did not move thereafter. Although, the media reports suggested that India has dropped out of the project but officially Russia has not informed about it. As per the initial plan, Russia was to share technologies related to the aircraft’s design and development; avionics and radar technologies. In fact, as it was a joint design and development project, the two sides agreed to equally share the intellectual property rights. The radar system included front and side radars. In 2017, India wanted to go with the stage-2 engine and the possibility of the plane’s modification to accommodate IAF requirement of twin pilots. Russia shared all the required information with India and a positive report was submitted by the IAF to the government suggesting to sign the contract. There was anticipation for the signing of the contract during the Indo-Russia summit of June 2017 but the contract was not signed. In May this year, Indian National Security Adviser Ajit Doval visited Russia and he informed them that India currently is not interested in the project. Minister of Defence Nirmala Sitharaman has also confirmed that India does not want to participate in development programme but may join it at a later stage. One is not sure why India did not go ahead with the project. There could be many reasons including lack of requisite budget. But, if India can pay more than Rs 1400 crore for one Rafale fighter, then India can naturally afford $ 100 million dollar Su-57. India cannot forget that at a time when India neither had the money nor strategic clout to go for competitive bid, India bought Su-30MKI from Russia which kept IAF’s strength and numbers intact. Still, it is the most potent fighter in IAF’s fighter fleet. After the failure of MMRCA, India, exactly 10 years later, is revisiting the path with same contenders. If everything goes perfect, India will get its first aircraft, not before 2020 and last aircraft around 2028/2029. What will be the relevance of a fourth generation fighter for a major power in a decade from now when its adversary has already developed a 5th gen fighter? Given India’s situation, revisiting the Su-57 will solve many a worry, one India will get access to 5th gen technologies, second this will help AMCA and most importantly, India can partner Russia in its sixth generation combat aircraft project. India needs to start working on next-generation technology else India will not be able to break the cycle of purchase and license production. The Su-57 joint development project is the only way to break this cycle. India must realize 5th generation is no more futuristic, F-22 is already two decades old. And India is nowhere in the field. Ten countries are already operating F-35. India is still struggling to buy 4++ fighters. This project would have provided two critical technology, AESA radar and engine, which could go long way in making India self-sufficient in military technology. India needs to have a relook at the aircraft. If there are apprehensions then those must be shared with Russia. They have been India’s most reliable defence partners. India should do a cost analysis of its ongoing procurement programmes and see whether they will equip India with futuristic technologies. In the time span of 110 jet programme, India can very well acquire the same number of Su-57 with ToT and can also ask for production of 50 per cent of its components in India which will usher local aerospace industry into the fifth generation era. With these possibilities, why not renegotiate?